Spoiler alert: We all fail. What you do with that failure, what you learn. and how you recover is what really matters. 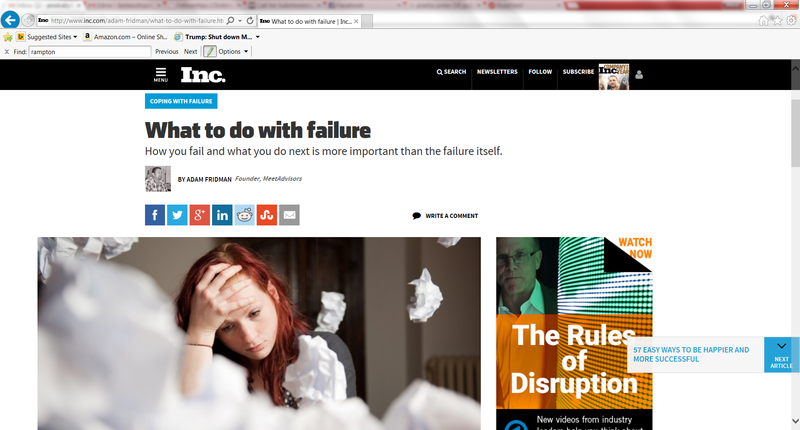 Inc.com just published a great article on making the most of failure, and featured one of my tips. Always keep an open mind and remain optimistic, even when that’s tough to do. There are always opportunities within failure, but sometimes you’ll have to dig for them. You might need to get creative or adopt a different perspective to make it happen. The most successful people also have the most failures, and that’s no coincidence. We’ve all heard the 1,000 light bulb failures to get a success story, and that philosophy extends to just about any startup, venture, or business. However, people don’t like to fail (no surprise there). When they do fail, they tend to sweep the experience under the rug without taking anything from it. Accepting and embracing failures is key to being successful. It’s something we need to actively change about our mindset. You can go back to past failures and pick out learning experiences at any time. Find more tips on how to optimize failures by checking out the Inc. article today.